Ramadan mubarak to you all. 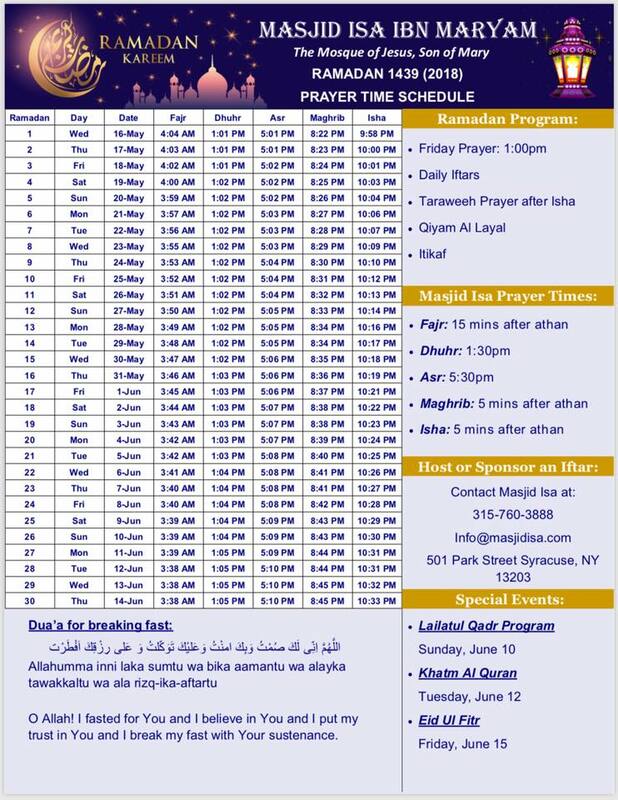 We’re pleased to provide Ramadan’s Prayer Schedule. 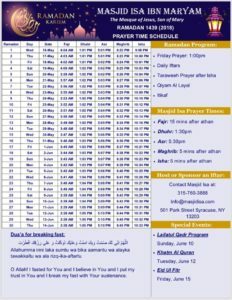 Taraweeh prayer starts every night after Isha Prayer. We hope to see you all there. May we receive the mercy and blessings of Allah in the holy month of Ramadan and be guided along the righteous path. May our hearts be filled with faith, piety and love for Allah and the blessing of Islam. May we be forgiven our transgressions and may he grant us patience in our faith and worship, in our social relationships and in our work. As we start this blessed month In Sha’a Allah. May he help us to keep our actions halal from what we say to what we see and hear to what we do. This course intends to help the students memorize Holy Quran. Students who wish to memorize a part or all the Quran, the experienced and professional Huffaz help devise a plan to make it easier for students to achieve their Quran memorization objective.